Oracle’s Primavera P6 Analytics is a packaged business intelligence solution that provides valuable insights into your Primavera P6 Enterprise Project Portfolio Management project portfolio performance so you can uncover trends, discover root cause of issues and forecast costs, helping you to drive efficiencies in your project processes by making better decisions about your projects. Built on top of the Oracle Business Intelligence platform (Oracle Business Intelligence Suite Enterprise Edition Plus), Primavera P6 Analytics comes packaged with a new updated version of the Primavera P6 Reporting Database. All of the data loading, data mapping, data models and dashboard reports you will need to start gaining unprecedented visibility into your Primavera P6 Enterprise Project Portfolio Management projects and portfolios is included. 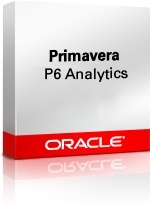 Discover the benefits of Primavera P6 Analytics.